Barack Obama picked Sonia Sotomayor as his nominee to the Supreme Court. It is a very bad choice. Sonia Sotomayor's track record as a judge is not good. In three of the five cases she ruled on as an Appeals court judge that were appealed to the Supreme Court, she was overturned by the Court. She also has track record of being hostile to civil rights enshrined in the Bill of Rights. Her rulings the First Amendment issue of free speech are inconsistent. In Pappas v Giuliani she supported the plaintiff's free speech right saying the government cannot punish an employee for writings "occur[ed] away from the office on [his] own time." But in Doninger v Niehoff, Sotomayor reasoned that free speech isn't a right specifically protected by the Constitution. She wrote: "As the Supreme Court cautioned years ago, "[t]he system of public education that has evolved in this Nation relies necessarily upon the discretion and judgment of school administrators and school board members," and we are not authorized to intervene absent "violations of specific constitutional guarantees." One would think a judge would know that free speech is a specific constitutional guarantee. Certainly, no senator should vote to confirm someone to the Supreme Court who thinks a violation of free speech isn't a violation of a specific constitutional guarantee. 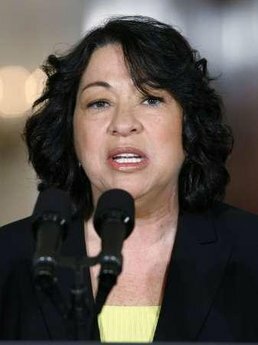 Sotomayor is also hostile to our Second Amendment rights. In Maloney v Cuomo, Sotomayor ruled that the Second Amendment does not apply to the state and local governments. That opinion is so radical it is in direct opposition to the opinion of the far left Ninth Circuit Court. In Nordyke v King, the Ninth Circuit recognized the Second Amendment as a deeply held right embodied in the Constitution that transcends state law. They recognized the fact that the Fourteenth Amendment clearly says the Bill of Rights protects those basic human rights from the state and local governments as well as from the federal government. In the case Ricci v DeStafano, Sotomayor endorsed racial discrimination. She ruled that a city government could deny city employees promotions based on the color of their skin. Most proponents of racial equality are disgusted by that kind of thinking. It certainly flies in the face of Dr. Martin Luther King's dream of a society and a judicial system that treats all races equally. Second Circuit judge, Jose A. Cabranes, scathing dissent said Sotomayor's ruling in Ricci: "It (her ruling) did so, moreover, in an opinion that lacks a clear statement of either the claims raised by the plaintiffs or the issues on appeal. Indeed, the opinion contains no reference whatsoever to the constitutional claims at he core of this case, and a casual reader of the opinion could be excused for wondering whether a learning disability played at least as much a role in this case as the alleged racial discrimination." Judge Cabranes basically said Sotomayor tried to bury the case and further said the Supreme Court should step in and rule on "the issues of great significance raised by this case". His dissent was more remarkable because Judge Cabranes is a liberal who was also appointed to the court by Bill Clinton. His dissent is undoubtedly the reason the case was accepted by the Supreme Court rather than being buried and ignored. The Supreme Court will probably overturn Sotomayor's Ricci decision while the Senate holding hearings on her nomination. Conservatives and other supporters of civil rights and equality under the law should take full advantage of this case to show Sotomayor as the radical she is. We cannot afford to elevate someone like Sotomayor to the Supreme Court. We cannot have someone who is hostile to any part of the Bill of Rights elevated to that Court. Nor should we accept another activist who thinks the court is the place to advance her political or biased social agenda. We need a Justice who believes in equal protection under the law for everyone regardless of race, position, wealth or lack of wealth. We need a Justice who believes in and cherishes the God given rights protected by the Bill of Rights, not someone who is hostile to them. We need a Justice who understands that the Fourteenth Amendment extends the Constitution's protection of these basic human rights and restrains the states and local governments from violating them as well as restraining the federal government. This woman seeks to become one of nine people in an office where unelected people who are accountable to no one and in office for life wield tremendous power. It is the Senate's responsibility to make sure a nominee to the high court is someone who is going to protect our rights, and who will judge cases impartially. This woman's record and public statements show she is not someone who should be a judge and she certainly, should not be a Justice of the Supreme Court. Any senator who supports this nominee will stand exposed as hostile to civil rights. John Bender is a freelance writer living in Dallas. He is a past staff writer for Ether Zone and his columns have appeared in various print and internet publications.